The core gameplay experience remains the same between versions, but the complexity and difficulty to learn increases (to mirror the growing age of any kid players). For example v1 uses a flat 1 Stamina for damage, whereas v2 uses D4 for damage. There is a re-themed version for Star Wars as well. Party of Light has an interesting history. The “game” started when I bought toy wooden sword and shields at a store on Vancouver Island. I was on a camping trip with family, including two of my nieces. Using the swords and shields I offhand made up a little fantasy story and we imagined ourselves fighting dragons, trolls, and other creatures as we walked down some train tracks. Our name was the Party of Light. When I got home from the trip I thought it would be fun to expand this concept into a simple, one-off RPG. I had somewhat talked to the nieces about the idea before, since they saw all the game sheets and rulebooks at my house. Anyway I made the Party of Light rules as a result, and have played the game half a dozen times with various members of my family. The game is a big hit to the kids, and still appeals to the older crowd. I’m excited to use rules like these, and make future game systems targeted to my own kid’s interests. The core idea of Party of Light is when a player (especially a kid) has an idea, the game master should say “yes, and/but…”. Almost like the fundamental rule of improvisation. So if the player wants to cast a fireball, have a wand of falling stars, or ride a unicorn, the rules are designed to make that happen. The game teaches basic RPG concepts like “talk to this NPC, but think of what your character would say”, move and do an action, choose what statistics are important, and here are a bunch of weird dice. Speaking of which the game intentionally uses D4, D6, D8, D12, and D20. Obviously that could be simplified, but I wanted to introduce standard RPG dice. Characters have 3 primary stats: Might, Mind, and Magic. They choose their Best and Worst. They also have a Speed (squares moved) and Stamina (hitpoints). Then some basic and special equipment. Gameplay happens on a board with squares. 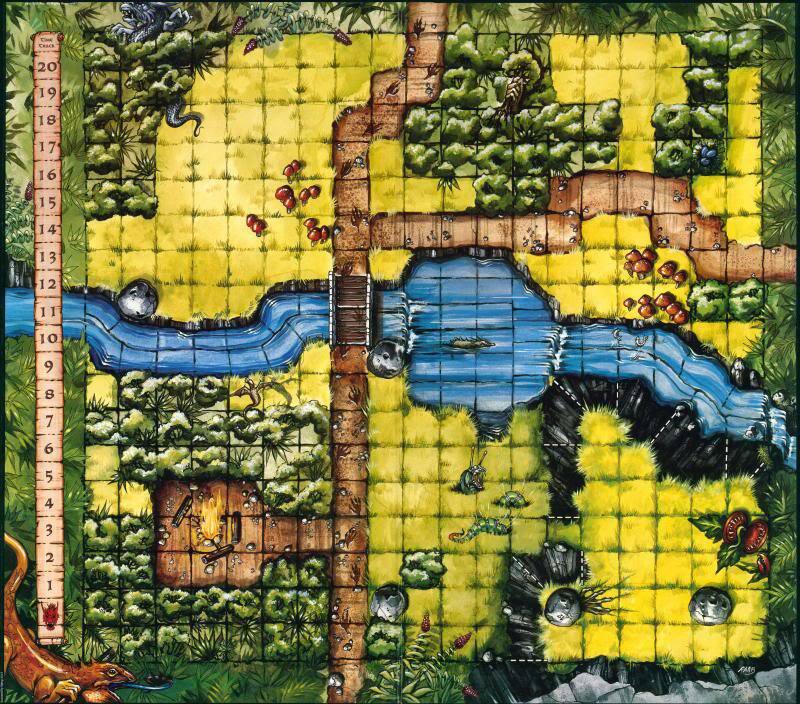 I used a few old paper maps I had made for D&D, as well as my ancient Dragon Strike maps. Combat is pretty simple, with moving a number of squares and doing 1 action. 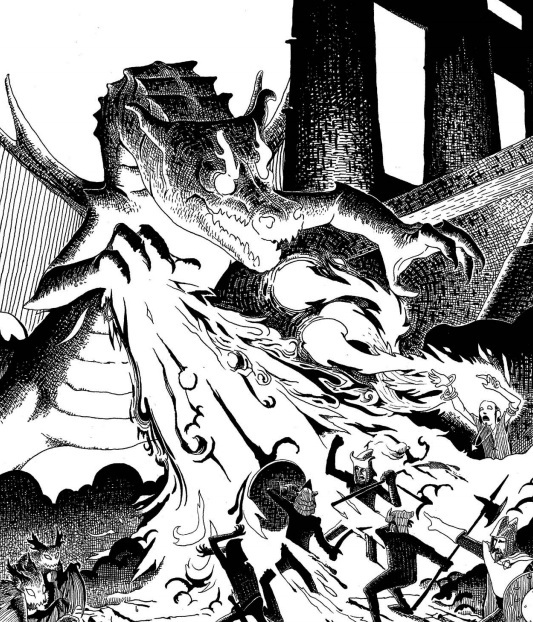 The actions are where the system shine, because instead of a preset list of major/minor actions or attacks, the players are left to choose their own. So a player with Might being the Best could say “I swing my sword in a big arc, hitting everyone nearby”. A person with Mind could say “I’m going to telepathically lift the target and throw them in a river”. And a Magic user could cast any spell they make up, from “Go Invisible” to “Summon a Pet”. The game master decides the Difficulty, using a few norms and rules. The difficulty corresponds to a dice type, going from smallest to largest. So Hard is D4, Easy is D12. The player needs to roll 4+ (regardless of dice type) to succeed. This corresponds to 25%, 50%, and 75% chance of success. Also once per game each player can do a Heroic Moment and use a D20 for a roll. So yeah pretty good base for exciting adventures and flexible encounters. As with Fickle RPG, which is a slightly more involved expansion on this idea, if there is a list of options/suggestions players restrict themselves to that list. When actions are as free form as Party of Light, you get some really neat spell ideas. Making a targeted game is fun. Party of Light is intended for me and my family. I’m okay with Magic being the most powerful, because my nieces wanted to be magic using princesses. Likewise I’m okay with the rules not fleshing out a world, as I can sketch up a map or use my old D&D geography as needed. In some ways not trying to focus on a “public” release of a game gives a lot more freedom. The other lesson is kids are giant sponges at a young age, as everyone knows. So getting them into a constructive, imaginative hobby is a great way to have healthy alternatives to watching TV and sitting on the computer when they’re teenagers. A bit preachy? Maybe, except that RPGs rule. Anyway it’s also nice because they haven’t seen a lot of RPGs you can re-use ideas and concepts that might seem tired or cliche to you (like fighting skeletons in a graveyard, or bandits raiding a wagon, or plot twisting the king to be a bad guy). I also am patting myself on the back a bit at the production quality of this game. 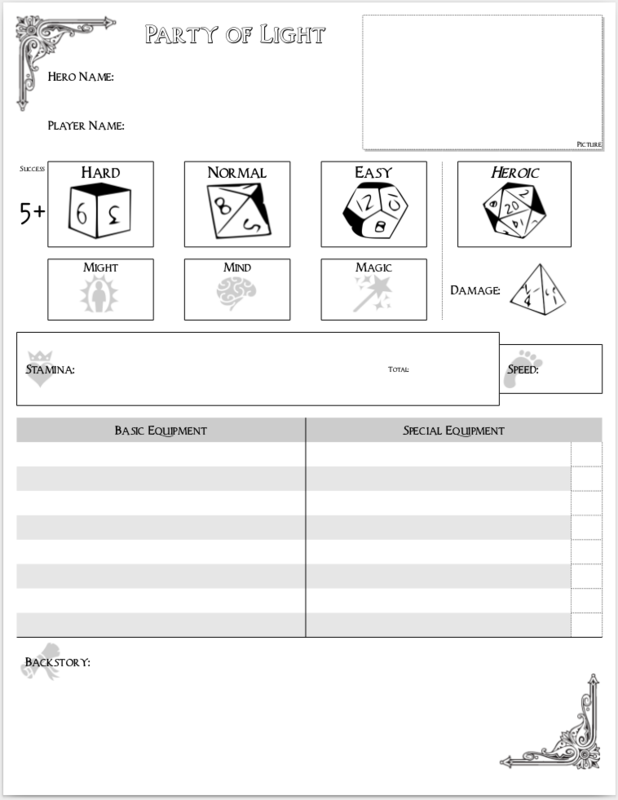 I’m really happy with the quality I can achieve with my character sheets and rulebooks. Using border images, suitable fonts, background fillers, etc. has really demonstrated my growth as a designer from my childhood days. Update 2017: I created a v2 of the rules that adds a tiny bit of extra complexity, namely changing the dice pool scaling (now D6, D8, D12) and switching from 1 flat Stamina damage to a D4 Damage Dice. Basically a bit more variety now that the nieces I play with understand the basic system well enough. Update 2018: I re-themed v2 of the rules to fit the Star Wars universe. So if you aren’t into medieval fantasy that’s an option for you.